When it comes to natural botanical perfume versus synthetic fragrances it should come as no surprise that all natural perfumes derived from natural botanical sources may hold the key to many positive life affirming and health-giving properties whereas manmade synthetic copies prove more hazardous to health. The precious oils from various flowers, resins,spices and fruits have been carefully claimed by gentle processes over many the centuries and become thefoundation of an industry that thrives today like never before. the perfume industry is worth billions of dollars worldwide and every year huge marketing efforts launch ever increasing number of designer and cheaper-alternative brands. But of course the perfume industry has also become widely compromised and perfume products have been adulteratedby the use of laboratory produced fragrances derived from synthetic chemical concoctions. Synthetic chemical fragrances abound in so many household, personal and perfume products these days and a sensitive nose can probably inform its owner when a 'perfume' is just...well, not natural. That wheeze-inducing chemical reaction is commonand a sign that such chemically created synthetic fragrances are prone to cause sensitivities and can triggerallergies and asthma attacks... They can also be behind other frightening health impacts. "...miessence® Botanical Perfumes are hand-blended in the traditional artisan method of natural perfumery using rare and exquisite botanical extracts, absolutes and essential oils solely as their aromatic source. The entire cornucopia of aromatic plants are explored in our perfumes... flowers, fruits, blossoms, leaves, twigs, barks, resins, woods, roots, rhizomes and seeds are all utilised for a multifaceted aromatic experience. 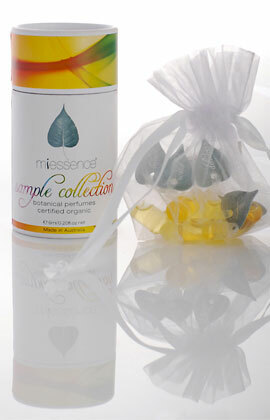 miessence® botanical perfumes are imbued with a depth of character and beauty rarely found in modern perfumery." "Natural perfumery, with a 4000 year history, is linked to nature, beauty and ritual. Not only are they aromatically aesthetic, but they impart therapeutic benefits, formulated solely with rare and expensive raw materials including essential oils, extracts and absolutes. They are simple, yet complex, being comprised of up to 30 unique ingredients. Their complexity is derived from the intricate orchestration of elements with thousands of known and unknown natural chemical compounds. Natural perfumes impart deep and complex fragrance notes with soft with subtle scent nuances that evolves over time with body chemistry. And blessedly, botanical fragrances don't outstay their welcome. They fade into your body gently and imperceptibly over time. Always fresh and fragrant, your botanical perfume simply needs an occasional top-up sometime during your day or evening to maintain your unique aromatic signature." "...The brief history (100 years or so) of synthetic perfumes is linked to recent developments in chemistry. They are comprised mainly, if not totally, of hundreds of inexpensive aroma-chemicals. Their fragrance of synthetics is always consistent, with simple and pronounced fragrance notes. Synthetic perfumes have a tendency to fight your natural scent and 'sour' over time, eventually going stale on the skin." "...Thousands of tons of synthetic fragrance are produced each year but with very few legislative checks or restrictions. Environmental scientists and health researchers are increasingly concerned about their affects on our health as well as their persistence in the environment. There are increased anecdotal and clinical accounts of fragranced products causing, triggering, and exacerbating health conditions such as allergies and asthma. Other concerns relate to the bioaccumulation of synthetic fragrance chemicals in human tissue and the long-term impact of suspected hormone disrupters..."
Synthetic fragrances add to both indoor and outdoor air pollution. Synthetic musk compounds are persistent in the environment and contaminate waterways and aquatic wildlife..."
A delicate bouquet of the most precious flowers of high perfumery blended with a sweet combination of powdery musk and vanilla warmth. Seduce the senses with exquisite memories. Soft, floral, and romantic. A sweet and heady mix of oriental resins, opulent flowers, fragrant spices and amber. Dare to risk where the Orient can take you. Enchanting, sensual and exotic. A cocktail of citrus fruits harmonised by hints of floral, woody and musky notes. Sweet youth meets cool sophisticate. Tangy, fresh and uplifting. Redolent of the forest floor with a heart of delicate woods and earthy mosses complemented by a fresh, citrus bouquet. Assert the complexity that’s uniquely you; alluring, charismatic and sensual; vibrant, earthy and green. Warm, gracious and elegant, this affirming composition of warm woods has a sweet and musky heart harmonised with aromatic herbs and spices. Close your eyes, breathe deeply and live the moment in an aura of controlled sensuality and self-confidence. A delicious dessert of chocolate, honey and vanilla with a floral hint of sweet jasmine. A fragrant treat sexier than chocolate and sweeter than sin. Divinely decadent and dulcet. Or you can try all six perfumes in a special trial pack - see details: Six All Natural Perfume Pack"
And remember... Christmas doesn't HAVE to be coming to treat yourself or a loved-one to something as rare and excellent as these natural perfumes!